In a Xamarin.Forms application, XAML is mostly used to define the visual contents of a page and works together with a C# code-behind file. The code-behind file provides code support for the markup. Together, these two files contribute to a new class definition that includes child views and property initialization. Within the XAML file, classes and properties are referenced with XML elements and attributes, and links between the markup and code are established. In Windows, use Visual Studio to select File > New > Project from the menu. 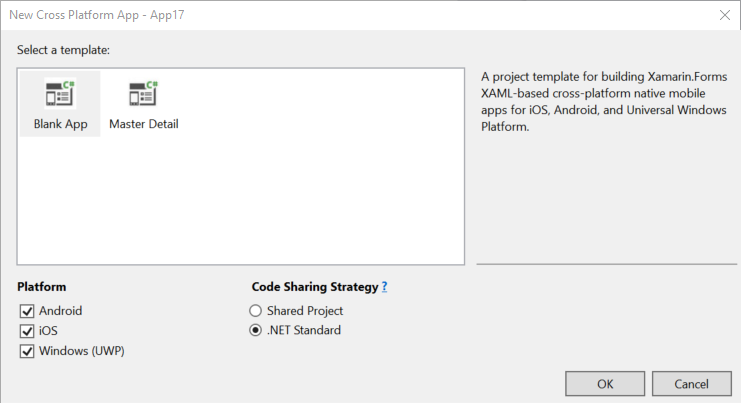 In the New Project dialog, select Visual C# > Cross Platform at the left, and then Mobile App (Xamarin.Forms) from the list in the center. Select a location for the solution, give it a name of XamlSamples (or whatever you prefer), and press OK.
Four projects are created in the solution: the XamlSamples .NET Standard library, XamlSamples.Android, XamlSamples.iOS, and the Universal Windows Platform solution, XamlSamples.UWP. 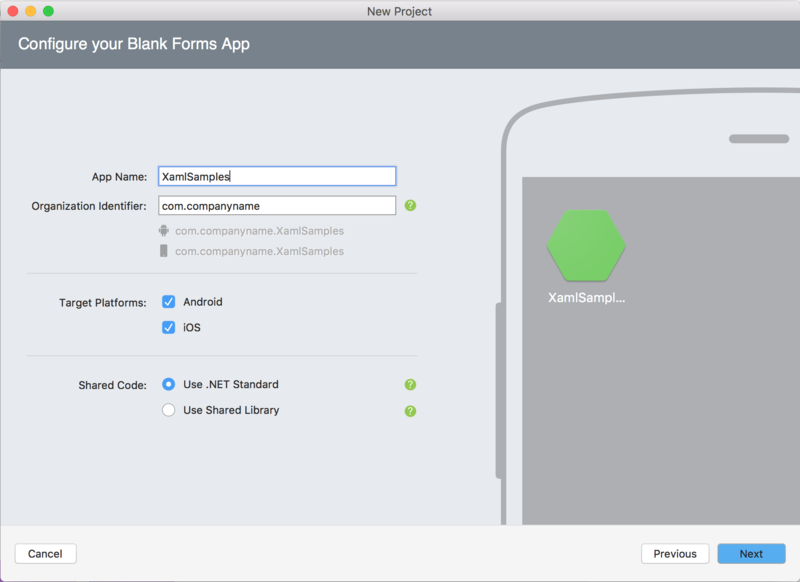 Three projects are created in the solution: the XamlSamples .NET Standard library, XamlSamples.Android, and XamlSamples.iOS. After creating the XamlSamples solution, you might want to test your development environment by selecting the various platform projects as the solution startup project, and building and deploying the simple application created by the project template on either phone emulators or real devices. Unless you need to write platform-specific code, the shared XamlSamples .NET Standard library project is where you’ll be spending virtually all of your programming time. These articles will not venture outside of that project. App.xaml.cs, a C# code-behind file associated with the XAML file. You'll need to click the arrow next to App.xaml to see the code-behind file. MainPage.xaml.cs, the C# code-behind file. The two XML namespace ( xmlns) declarations refer to URIs, the first seemingly on Xamarin’s web site and the second on Microsoft’s. Don’t bother checking what those URIs point to. There’s nothing there. 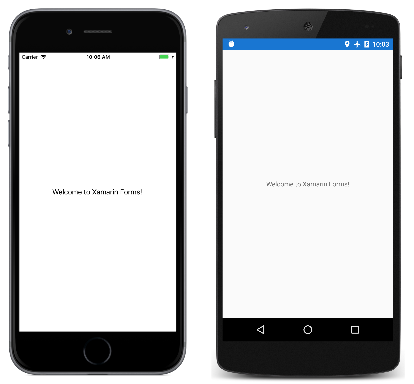 They are simply URIs owned by Xamarin and Microsoft, and they basically function as version identifiers. 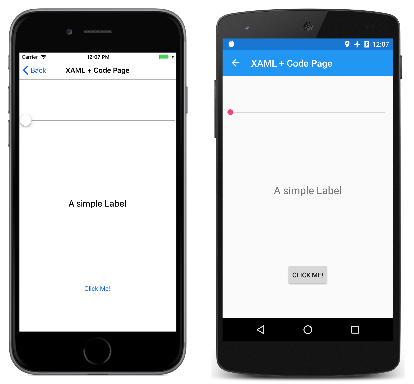 The first XML namespace declaration means that tags defined within the XAML file with no prefix refer to classes in Xamarin.Forms, for example ContentPage. The second namespace declaration defines a prefix of x. This is used for several elements and attributes that are intrinsic to XAML itself and which are supported by other implementations of XAML. However, these elements and attributes are slightly different depending on the year embedded in the URI. 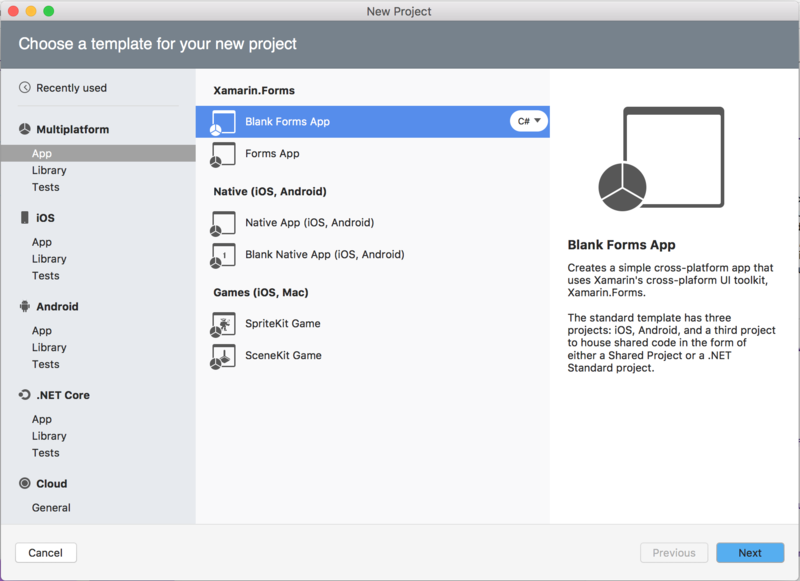 Xamarin.Forms supports the 2009 XAML specification, but not all of it. The local namespace declaration allows you to access other classes from the .NET Standard library project. At the end of that first tag, the x prefix is used for an attribute named Class. Because the use of this x prefix is virtually universal for the XAML namespace, XAML attributes such as Class are almost always referred to as x:Class. The x:Class attribute specifies a fully qualified .NET class name: the MainPage class in the XamlSamples namespace. This means that this XAML file defines a new class named MainPage in the XamlSamples namespace that derives from ContentPage—the tag in which the x:Class attribute appears. The x:Class attribute can only appear in the root element of a XAML file to define a derived C# class. This is the only new class defined in the XAML file. Everything else that appears in the XAML file is instead simply instantiated from existing classes and initialized. The MainPage class derives from ContentPage, but notice the partial class definition. This suggests that there should be another partial class definition for MainPage, but where is it? And what is that InitializeComponent method? When Visual Studio builds the project, it parses the XAML file to generate a C# code file. If you look in the XamlSamples\XamlSamples\obj\Debug directory, you’ll find a file named XamlSamples.MainPage.xaml.g.cs. The ‘g’ stands for generated. This is the other partial class definition of MainPage that contains the definition of the InitializeComponent method called from the MainPage constructor. These two partial MainPage class definitions can then be compiled together. Depending on whether the XAML is compiled or not, either the XAML file or a binary form of the XAML file is embedded in the executable. At runtime, code in the particular platform project calls a LoadApplication method, passing to it a new instance of the App class in the .NET Standard library. The App class constructor instantiates MainPage. The constructor of that class calls InitializeComponent, which then calls the LoadFromXaml method that extracts the XAML file (or its compiled binary) from the .NET Standard library. LoadFromXaml initializes all the objects defined in the XAML file, connects them all together in parent-child relationships, attaches event handlers defined in code to events set in the XAML file, and sets the resultant tree of objects as the content of the page. Although you normally don’t need to spend much time with generated code files, sometimes runtime exceptions are raised on code in the generated files, so you should be familiar with them. For more interesting visuals, all you need is more interesting XAML. Two files are added to the project, HelloXamlPage.xaml and the code-behind file HelloXamlPage.xaml.cs. The ContentPage.Content tags are part of the unique syntax of XAML. At first, they might appear to be invalid XML, but they are legal. The period is not a special character in XML. Also notice that a Title attribute has been set on the root tag. 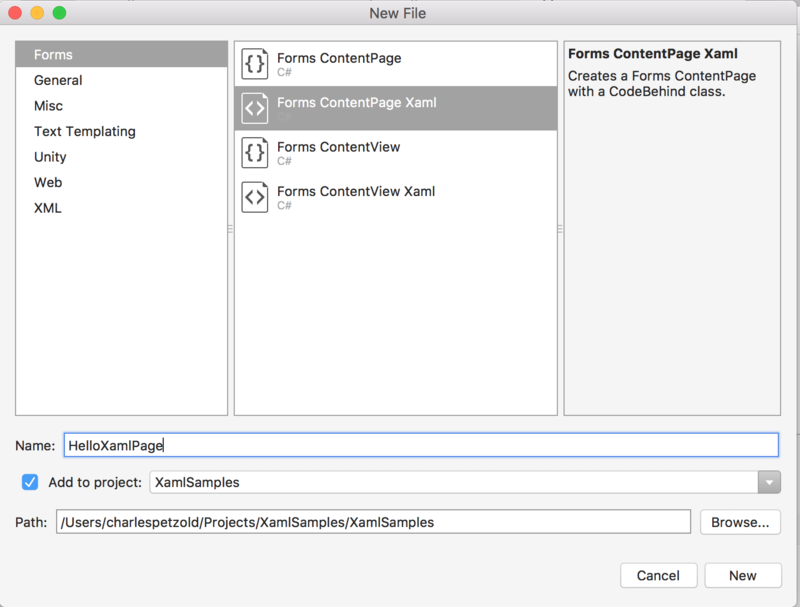 At this time, the relationship between classes, properties, and XML should be evident: A Xamarin.Forms class (such as ContentPage or Label) appears in the XAML file as an XML element. Properties of that class—including Title on ContentPage and seven properties of Label—usually appear as XML attributes. Many shortcuts exist to set the values of these properties. Some properties are basic data types: For example, the Title and Text properties are of type String, Rotation is of type Double, and IsVisible (which is true by default and is set here only for illustration) is of type Boolean. The HorizontalTextAlignment property is of type TextAlignment, which is an enumeration. For a property of any enumeration type, all you need supply is a member name. These converters govern the allowable syntax of the property settings. The ThicknessTypeConverter can handle one, two, or four numbers separated by commas. If one number is supplied, it applies to all four sides. With two numbers, the first is left and right padding, and the second is top and bottom. Four numbers are in the order left, top, right, and bottom. The LayoutOptionsConverter can convert the names of public static fields of the LayoutOptions structure to values of type LayoutOptions. The FontSizeConverter can handle a NamedSize member or a numeric font size. For the alpha channel, keep in mind that FF is fully opaque and 00 is fully transparent. In these cases, the digit is repeated to form the value. For example, #CF3 is the RGB color CC-FF-33. When you run the XamlSamples program, the MainPage is displayed. To see the new HelloXamlPage you can either set that as the new startup page in the App.xaml.cs file, or navigate to the new page from MainPage. You can navigate back to MainPage using the < Back button on iOS, using the left arrow at the top of the page or at the bottom of the phone on Android, or using the left arrow at the top of the page on Windows 10. However, you are likely to consider this program to be functionally deficient. Perhaps the Slider is supposed to cause the Label to display the current value, and the Button is probably intended to do something within the program. These event handlers do not need to be public. Notice that assigning a handler to an event has the same syntax as assigning a value to a property. If the handler for the ValueChanged event of the Slider will be using the Label to display the current value, the handler needs to reference that object from code. 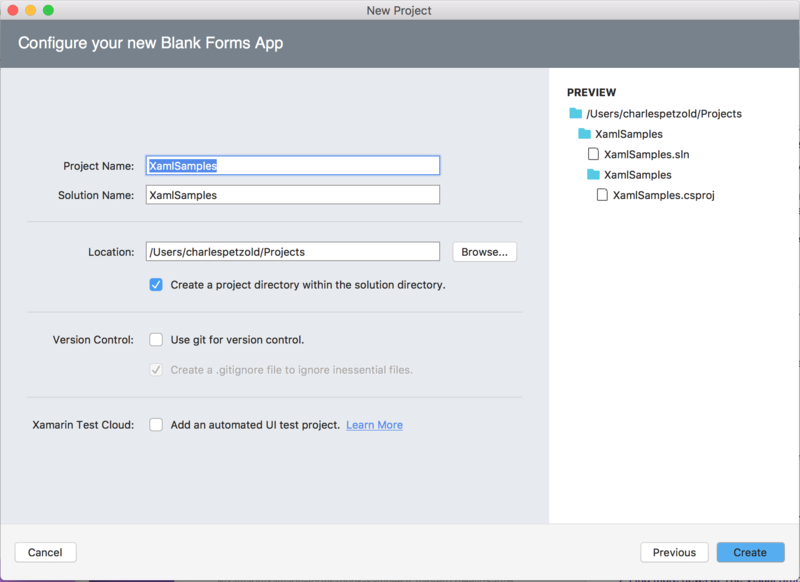 The Label needs a name, which is specified with the x:Name attribute. The x prefix of the x:Name attribute indicates that this attribute is intrinsic to XAML. The name you assign to the x:Name attribute has the same rules as C# variable names. For example, it must begin with a letter or underscore and contain no embedded spaces. The method is defined as async because the DisplayAlert method is asynchronous and should be prefaced with the await operator, which returns when the method completes. Because this method obtains the Button firing the event from the sender argument, the same handler could be used for multiple buttons. You’ve seen that an object defined in XAML can fire an event that is handled in the code-behind file, and that the code-behind file can access an object defined in XAML using the name assigned to it with the x:Name attribute. These are the two fundamental ways that code and XAML interact. The declaration of this field allows the variable to be freely used anywhere within the XamlPlusCodePage partial class file under your jurisdiction. At runtime, the field is assigned after the XAML has been parsed. This means that the valueLabel field is null when the XamlPlusCodePage constructor begins but valid after InitializeComponent is called. After InitializeComponent returns control back to the constructor, the visuals of the page have been constructed just as if they had been instantiated and initialized in code. The XAML file no longer plays any role in the class. You can manipulate these objects on the page in any way that you want, for example, by adding views to the StackLayout, or setting the Content property of the page to something else entirely. You can “walk the tree” by examining the Content property of the page and the items in the Children collections of layouts. You can set properties on views accessed in this way, or assign event handlers to them dynamically. Feel free. It’s your page, and XAML is only a tool to build its content. With this introduction, you’ve seen how a XAML file and code file contribute to a class definition, and how the XAML and code files interact. But XAML also has its own unique syntactical features that allow it to be used in a very flexible manner. You can begin exploring these in Part 2. Essential XAML Syntax.